Bhicoo Manekshaw, elegant with her short, elegantly set silver hair, finger nails neatly manicured is 85 years and proud to be so. One of the best-known names in the world of gastronomical delights, she arrives before 11 every morning at her son-in-lawrestaurant Basil and Thyme at the Santushti complex. She oversees the menu for the day and makes the soups, sauces and desserts for the day. Coming from a traditional Parsi background, Bhicoo recalls that it was the excellent Parsi and continental food served at her parents’ home that enthused her about cooking. The cook was a Goan who had specialised in both cuisines. In school, Bhicoo was not interested in neither science nor French. She could not imagine how these subjects would help her in life. She opted for domestic science because it would help her to become a good housewife and she excelled in continental cuisine. Bhicoo has written three books on cuisine. Wife of Air Vice Marshal J.H.F Manekshaw, from the Air Force wives she collected traditional Indian recipes and came out with her first book in the early 1970s. 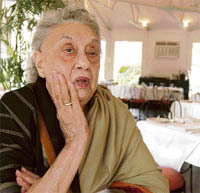 Her second book on Parsi food and customs was a runaway success. She would get calls from Dubai, Iran and other places from ecstatic Parsis who had conducted the Navroz festivities culling out the finer intricacies from her book. Finally in 2007, she produced the coffee-table book—Feast of Love—50 Classic Recipes. In the early 1960s her husband was posted in London and she literally fought her way into doing an advanced three months course of Cordon Bleu. Only 10 people are taken for a course and they had all booked a year earlier. But since her husband had a short posting she could not wait to get into the next batch so she sought an appointment with the principal and showed her recipes. She even gave a demonstration of her culinary prowess and was accepted for the course the same year. She has shared her joy of whipping up mouth watering dishes with Air Force wives from all over the world. She has been a consultant for food and recipes to the Western Hotel in Bangalore and the India International Centre. Air India flights as well as VIP flights from India served her menus. How does this 85-year-old keep fit? I don’t like walking, she admits. Early mornings and after sunset she sits in her verandah in Hauz Khas and listens to bird songs. Her garden has a huge mango tree and she watches the birds darting in and around the tree. She soaks in the serenity of the mornings and evenings. She eats everything but to prevent herself from putting on weight she always gets up from the table thinking, “I could eat a little more”. She does Suduko to keep the brain ticking and devours three newspapers a day. “I can spend hours pouring over my cookery books. It’s unfortunate I can’t take them with me to the next world”, she quips. Her two daughters drop in to see her every day. “Each of them is equal to 200 boys”, she says.